AHey guys! Finally i got access to my account! I miss posting here at LALD! What’s up? Here’s a 1/24 S13 build for all of you to enjoy! I just finished building this 1/24 model kit and here are some proper pictures for it! It's my time to custom this Bmw 3.0 Csl. Hey guys! Whats up, i need to custom this Bmw. So i took shots first. Here it is. I also need some color suggestions? My local gas station has a diecast promo.. Audi R8. Petron Corporation had a promo. If you gas up for about 13$ you get a chance to buy 1 of 3 1/24 Scale Diecast for 17$. I chose the R8. It’s been awhile I haven’t posted any of my customs here. But here’s a Yellow Porsche to save the day. Hope y’all like it. This porsche is sick! Right? Who has a ps4? Here are some new 86! And they are part of my wish list! I just got this from the customizing t shirt shop! For 5$! Sick! Custom Black Rims and LaLD Stickers.. 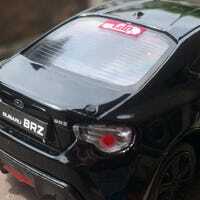 I just got this Top Mark Subaru BRZ Model just about now.. And.. Here is my Summer Photo Contest entry, it’s rainy season here so. ..
Here’s a build post of my Custom submitted at Superfly’s Hotwheels Competition.